No. 1. A Shield called a Roundel. No. 3. A Leaden Mallet, used by the archers, mentioned in the military part of the preface. No. 4. An Iron Mace used by the cavalry, the original is in the Tower [of London]. No. 5. A Black Bill in the Armory of the Town Hall, Canterbury. No. 6. A Pertuisan in the Museum of Mr. Green of Lichfield. No. 7. A Suit of Armour in the Tower of London, which it is pretended belonged to Joun de Curcy, earl of Ulster, confined there anno 1204, but probably is not so ancient, plate armour, as it is generally conceived, not being in use at that period. No. 8. A Suit of bright Morion Armour, worn by the Infantry in the reign of Queen Elizabeth; it derives its name from the head piece stiled a Morion. No. 9. 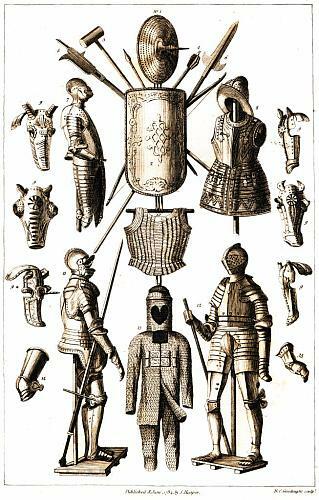 Different Chanfrins or Cheiffronts, being masks of iron for defending the heads of horses, from the horse armory in the Tower of London. No. 10. A Cuirass of Plate Mail, composed of small iron plates fastened one over the other, so as to yield to every motion of the body, the original is in the collection of curiosities at Don Saltero’s Coffee House, Chelsea. No. 11. A Complete Suit of Armour shewn in the Tower of London, and said to have belonged to John of Gaunt, Duke of Lancaster, fourth son of Edward III. He died [in] 1399. No. 12. A Complete Suit of Armour in the Tower of London, made for Henry VIII. when he was but eighteen years of age. It is rough from the hammer. No. 13. A Hawberk or suit of chain mail armour, composed of iron rings. It consists of a helmet, coat and breeches, the original is in the Museum of Mr. Green of Lichfield. No. 14. Knee Piece called a Genouillere.